A hotel in Brighton which was bombed by the IRA during the Conservative Party conference in 1984 has been sold to a private investor. The Grand Hotel, in King's Road, was put up for sale in November for £50m after its previous owners, the De Vere Group, refurbished it. 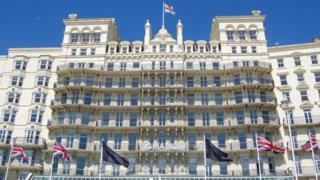 The hotel, which opened in 1864, has now been sold for an undisclosed sum. Andrew Mosley, general manager, said the new owners "want to invest in the Grand". He said: "It is a magnificent building, we're very proud of it and proud to work here and looking forward to its future as a result of its sale. "It was sold for a number of reasons, but mainly because the hotel didn't sit strategically with the portfolio of hotels owned by De Vere, so they decided to let it go. "[It was sold to] a private investor, we're not making that name public, but we're going to be run under a management contract by a hotel specialist company." The 1984 IRA bombing of the hotel, during the October Conservative Party conference, killed five people and injured 31 others. The prime minister, Margaret Thatcher, and her cabinet were its targets. In June 2012, a £7m programme to refurbish the hotel's 201 bedrooms and 11 conference rooms began.